If you’re like most people, you don’t enjoy running outside in the cold during the winter and fall months. Even during warmer months, you’ll need to avoid rain storms to ensure you get your workout in for the day. With a treadmill, all of this is avoided, but there is one concern: the number of calories burned. The outside terrain provides slopes and inclines naturally so that you’re muscles are engaged differently throughout the course of your workout. Ultimately, this helps build muscle and burn more calories. When you want to boost your treadmill workout to ensure optimal caloric burn, there are quite a few steps you can take. The obvious choice is to run a longer duration if you want to burn more calories. If you run at a pace of 6 MPH, you’ll burn 330 calories if you weigh 150 pounds. The more you weigh, the more calories you’ll burn. Increasing your duration by just 15 minutes will add 165 extra calories burned during your workout for a total of 495 calories (using the 150 pound weight above). However, if you’re looking to burn more calories in the same duration, our tips below will help. Naturally, the faster you run, the more calories you’ll burn. Not many people can sustain running at 6 MPH for a long duration, but this doesn’t mean you can’t start at a lower rate. When running, start at a comfortable speed and slowly increase it every minute. If you can comfortably run at 4 MPH, increase it to 4.5 and 5.0 and remain at that speed for as long as you can. Now, when you feel like you can no longer keep up the pace, drop the speed down slowly and try not to reach the 4 MPH mark. It’s all about intensity. If you can increase your running speed, you’ll burn more calories. Even slight increases will provide amazing results. Jog for 1 – 2 minutes. Increase the speed to a sprinting speed for 30 seconds. Return to your jogging speed. These short bursts of sprinting will cause you to boost your metabolism and burn more calories in the process. Jogging at a 0 incline. Increasing the incline to 3. Increase the speed to a steady run. Drop back to your jogging speed. Change the incline to 2. You can choose any method or arrangement you want, but alternating speed and incline levels will force your body to burn more calories while on the treadmill. We’re not talking about pumping iron. We’re talking about adding ankle and arm weights when you’re running on the treadmill. You’ll need to maintain a slower speed, but you’ll be building muscle and adding to the intensity of your workout. If you can jog comfortably and safely, you can even hold dumbbells in your hand while jogging. Just remember to attach the emergency stop to yourself for added safety. Some people even choose to do something entirely different. Slowing down the speed of the treadmill greatly, users will do walking lunges after a 2 minute sprint at 5 MPH, or whatever level you can maintain. This is an extremely difficult exercise because you’ll really be pushing your quads to the extreme, but it is well worth the effort. 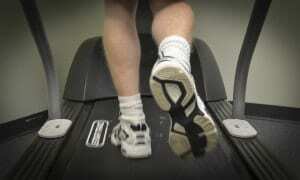 Do you jump on the treadmill without a workout planned? A lot of people tend to neglect the importance of coming up with a proper treadmill workout plan. There are a variety of different workouts. Just pick a workout from our detailed workout guide that suits the type of workout you want to try. If you keep track of your workouts, you’ll be able to judge your approximate caloric burn as well as adjust your workout intensity in the future. Through small tweaks in the way you run on the treadmill, you can see amazing results.